Sterling Silver, Southewstern and Native American Indian Jewelry, Mesa, AZ. Authentic Navajo Jewelry made by Navajo Artisans for Skystone Creations in our store. Features Outstanding, Authentic Zuni, Hopi and Navajo Arts, Crafts, and Sterling Silver Jewelry made by Native American Indians. Contemporary pieces of Sterling silver jewelry often using gold and gemstones. Contemporary pieces of jewelry often carry traditional symbolisms of the natural world. Monthly Specials and discounts from a selection of the many fine pieces of Sterling silver jewelry and products we carry. You will need the to check this section regularly. Contemporary Amber jewelry designs by Polish artist Danuta and Mariusz Gliwinski, as well as, other fine artisans from Polish and Native American indian cultures. Featuring original works of art by many artisans represented in paintings, sculptures, mixed media, Pottery, and jewelry. Skystone Creations will be introducing a New Line of Jewelry. Designed and Made by Skystone from our talented Silversmiths. This jewelry line is sure to be of unique design. Please, check back soon, or call for more details on the availablity of this line. Elka and Victor Stapel are the owners of Skystone Creations since 1985. Working side by side with Navajos for almost 30 years, developed a certain sensitivity towards their culture and well being. Turquoise (Skystone) is the main stone that they use in their jewelry, but other gems like Garnet, Amethyst, Lapis Lazuli, Denim Lapis, Malachite, Tiger Eye, Black Onyx, Lab Opal, White Mother of Pearl, Pink Mussel Shell, Paua Shell, and Red Coral mounted in Sterling Silver compliment the remainder of their Navajo jewelry selection. The variety of different gemstones is helpful in satisfying customers who prefer something different than the traditional Turquoise gemstone. In the Navajo Jewelry Section, each piece you find displayed is handcraft by Navajo Silversmith's in our store and is checked for perfection. 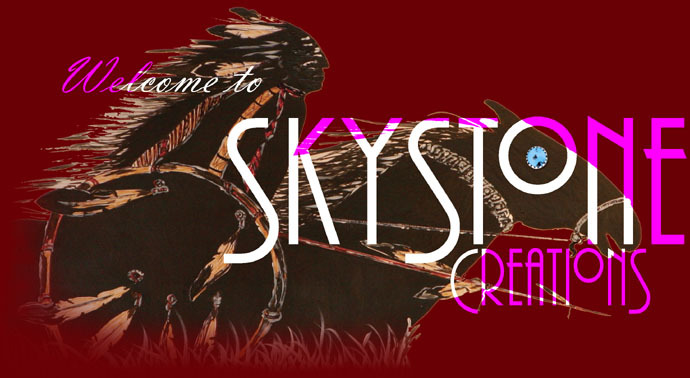 Skystone Creations' Navajo jewelry are stamped with the letters "SC", indicating it's originality from our store. "Skystone" is the Indian's name for turquoise. Natural turquoise was very important to the Native Americans and the jewelry they made from it held a special place in their way of life. Skystones, turquoise stones, are stones of protection, prosperity, and blessings. 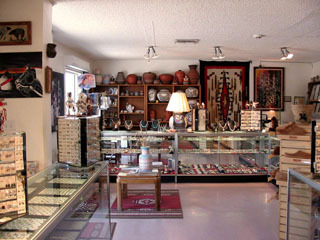 Since people admire different styles and tribal techniques, Elka and Victor often travel to New Mexico, where they acquire additional Native American indian jewelry. 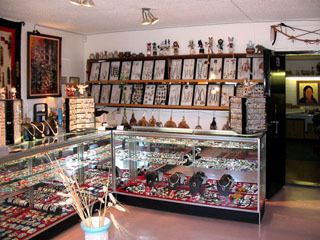 Many of the fine jewelry items are purchased directly from the artist. By purchasing direct from the Native American artist they can assure quality and lower prices to their customers. You will find many of these quality pieces of jewelry in our Southwestern Specialties and Contemporary Southweatern sections. More recently, we've acquired a new line of jewelry direct from Poland. This high fashion Amber jewelry comes to us from Polish artisans Mariusz and Danuta Gliwinski. This fine Amber Jewelry is designed and created by the Gliwinski's at their Ambermoda gallery in Poland. Their jewelry is exhibited thoughtout Europe and is now available in the United States at Skystone Creations. Elka and Victor have always said " It is a pleasant task to acquire jewelry you think the customer would like, but wonderful, when you see the excitement it brings to them." Our goal "letting our customer know that their purchase, whether large or small, is treated honestly and with dignity." Please feel free to browse our many different selections of fine Sterling Silver jewelry, and Gemstone jewelry . If you do not find what you are looking for, please e-mail your request or use the request form located on our support page, we will try our best to get it for you. Need your Jewelry repair? We do repairs, too. Orders received Online are secured through encryption for your protection. 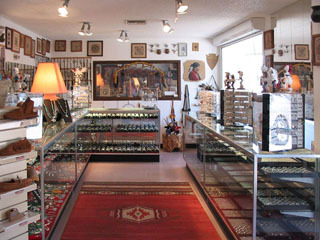 We do have a large selection of authentic indian jewelry in our store. Most orders shipped same day. During your next visit in Phoenix, we invite you to our shop to see our large selection Native American Indian jewelry of Zuni, Navajo and Contemporary Southwestern Sterling Silver jewelry, crafted by other talented artisans, also Amber jewelry from the Baltic Sea.